The $125,000 bonus is not a “fatter” figure. It has been this amount for the last several years. The latest 2012 bonus release was the same. IMO, it will need to increase significantly to keep pilots in. Didnt the air force just cut like 200 pilots during ’11 rif? Here we go again… now we need them. Please God let me be Accepted to the rated board 12OT03!!!! Here’s my chance! And yes this is a never ending roller coaster! This is just a further continuation of the pendulum in Air Force personnel numbers. 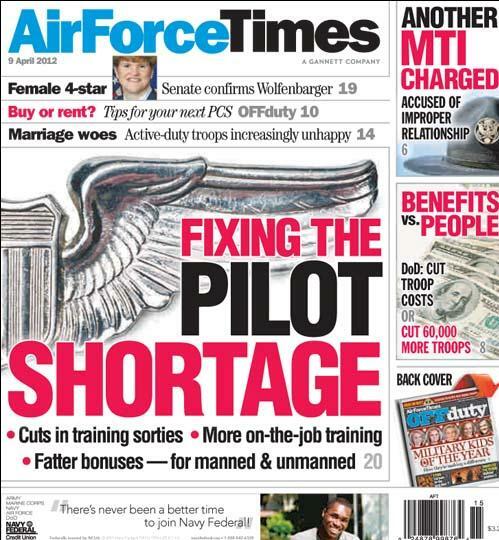 The Air Force has horrible personnel management, ramping up pilot training numbers at the start of the last decade, paying officers to leave early or forcing them out via RIF, and now suddenly facing a shortage. The AF should just outsource the whole personnel management function to a company that specializes in human resource management. AF manpower needs, bonuses, and its training pipeline are constantly out of sync. Need pilots? My hand is still raised! I have a great package and have been selected twice before. I lost my selection both times due to budget/ manning cuts. My FC1 is approved and I’m ready to go. Just wavier my age, since I am now 30 years old, and you’ve got a pilot. I haven’t lost hope. I’m interested to see how the AF will deal with the mass airline pilot exodus because where the motivation to stay in with the current deployment ops tempo. The bonus also better get a little sweeter since it been the same for a long time. With time value money and inflation it’s not worth as much now as it was in the late nineties. I am still absolutely amazed by a service who is throwing Majors out of the service at 14.5 years because of financial concerns yet they are still giving pilots bonuses. They should do away with Aircrew Incentive Pay. If they want to get out, let them. Good luck trying to find a job in this economy. The bonuses were designed to keep pilots in military uniform when the economy was booming and job prospects on the outside were good. This is no longer the case. You want to save money? Stop paying people extra to do jobs that are rewards in themselves. Service before Self? Sounds more like Self before Service to me. I served a long career without a single extra cent above my salary vice that received on deployment. The attitude of entitlement appalls me. Ceelo- I don’t think that what you have proposed is going to fix the shortage or the budgetary concerns. Take away flight pay, stop offering the bonus, and you will see droves of qualified instructor pilots leaving the AF. I know you say good luck getting a job, but I think it would be reasonably easy. Think about it. A 35 year old pilot with a bachelors and likely a masters? Easy hire. You are entitled to your thoughts for sure. I’ve just completed a job search…I can tell you it is not as easy you think it is. I have two Masters Degrees and have commanded a Squadron in combat. It took me approximately seven months before I could find a job in the D.C. area. I also believed that I would walk off of active duty into a lucrative job and got a rude awakening. My research indicates that even if manage to get full credit for your skill sets (negotiations can be a bear), you can hope to start out at anywhere from 23-70K as a First Officer flying for regional or the major Airlines (in the D.C. area). That is considerably less than a 35 year old Major in the Air Force makes. There are plenty of pilots out there with the ability to leave who haven’t based on the desire to continue their current quality of life. The economy will recover…slowly. I don’t think you’ll see the prolific hiring(which drove the creation of the incentive pays) of Pilots by the Airlines for a little while yet. Either money is truly scarce for the Air Force or it isn’t. This is certainly a way to cut costs besides disposing of the most combat experienced personnel we’ve ever had as a nation.